A stranger holds the key to a staggering truth. In a primitive village, a hunting party is attacked by a ferocious creature. To Asa, leader of the party, it is a demon. To Asa's father, Gautvin, it is an angel come to forgive long-forgotten sins. But to Imma, the lord's deaf-mute daughter, the creature is a miracle: An otherworldly presence that speaks to her in ways that others can't. As the village struggles to decide what to do, an unlikely bond forms between Imma and the creature. But events soon spiral out of control in ways that threaten to tear the small village apart, and Imma must choose between the world she knows and a future she never imagined could exist. 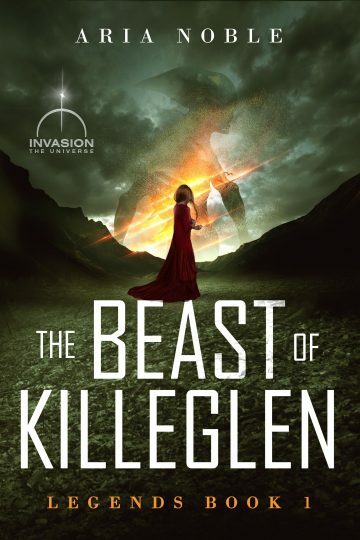 Invasion meets the Brothers Grimm in Aria Noble's unforgettable novel, The Beast of Killeglen. Grab your copy of this tale of ancient folklore that dovetails into the Invasion Universe in wonderful and unexpected ways!